A Shaped region of influence is suited for irregular forms. Modify the region parameters to refine the shape's boundaries. If you selected the Shaped option in the Layer Properties window or in the Rigging tool properties, the zone of influence will be square. This square has control points on all four corners and each control point as two control levers. 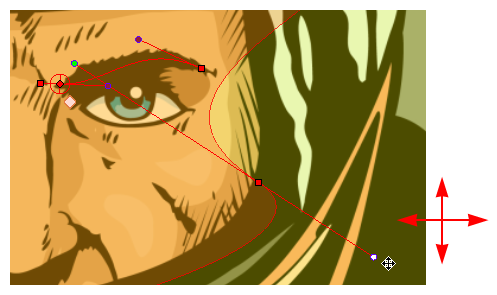 If you converted an Elliptic zone to a shape, the zone will have more control points and handles. 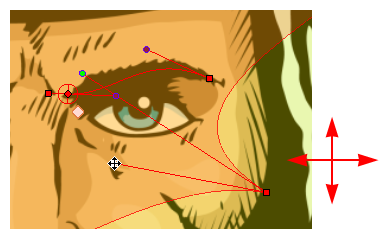 In the Layer Properties window, in the Region of Influence tab, set the Influence type to Shaped. 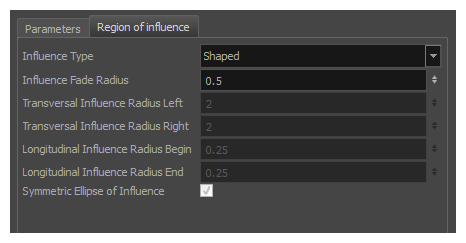 All radius options are disabled except the Influence Fade Radius option—see Setting Up Shaped Regions of Influence. 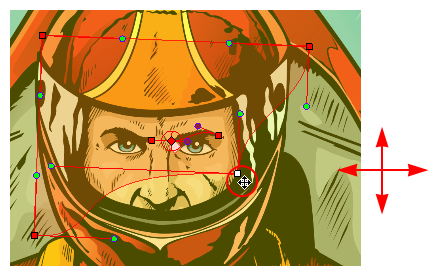 In the Camera view, use the Rigging tool and drag a control point to redefine its position and shape. Click and drag the control lever handle to modify the corners and redefine the shape. Hold Alt down while dragging the control lever handle to move one handle at a time.